Post Cap Lights elevate the look of your deck for 24 hour enjoyment. 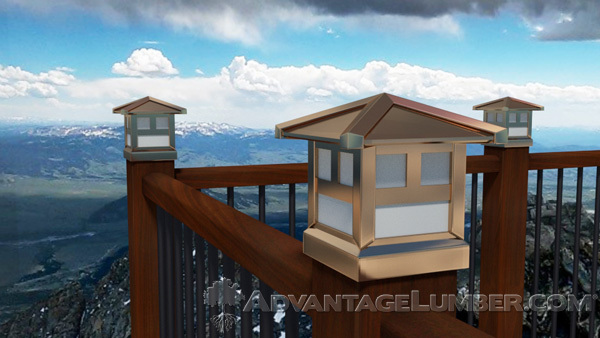 The most noticeable and biggest fixtures for accent deck lighting are post-cap lights. 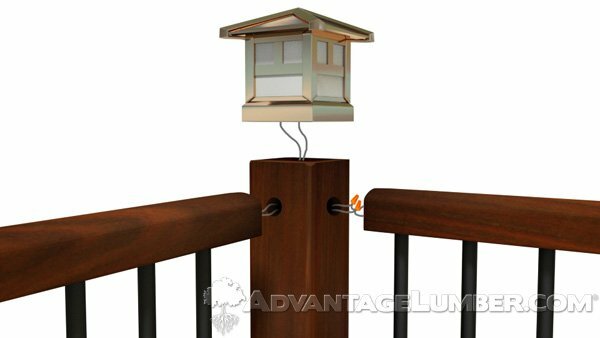 Post-cap lights are ideal for lighting up stairways and deck entrances. They also act as indicators for middle posts along the edge of the deck. Not only will post-cap lights enhance the look of your deck, it will add safety to your home. This is ideal for relaxing outdoors after hours! Detailed post cap instructions are included in every package. Usually made to fit over 4×4 or 6×6 posts, some fixtures are made to fit both. Lights come in many different colors and materials. Whether you want metal, glass, wood or vinyl, post caps come in an array of styles that will match your deck perfectly. You can even order unlighted post caps to match post-cap lights. Post-cap lights will give your deck the warmth and a gentle glow you’ve been looking for. Check out AdvantageLumber.com for the best post-cap lights for your outdoor space. This entry was posted in Deck Lighting, Decking Installation, How-to Build and tagged deck lighting, deck post caps, post cap lighting, post caps on August 20, 2013 by Mr. Ipe Hardwood.